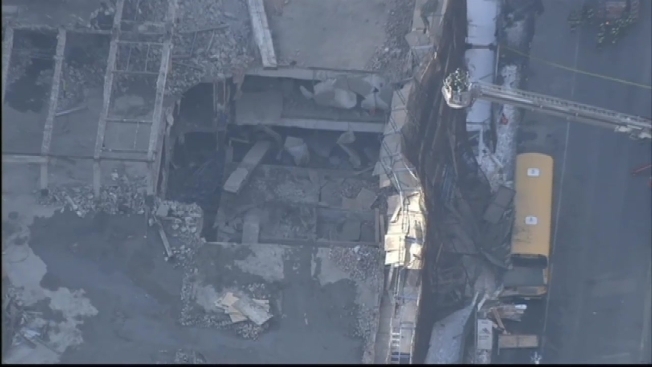 The outer shell of an abandoned three-story garage being torn down in Manhattan partially collapsed Wednesday, injuring a worker who had been inside, scattering debris onto a school bus and forcing authorities to shut down streets in the area, authorities and witnesses say. Fire officials said a 50-by-50 foot section of the building on 11th Avenue and West 57th Street collapsed inward around 3:30 p.m., causing each of the three floors to pancake onto the one below it. Fifty to 60 construction workers were at the site, but only six were in the section that collapsed, authorities said. One of the workers was on the third floor and fell three stories to the ground as each floor gave way beneath him, fire officials said. He managed to walk out of the building and was taken to the hospital with minor injuries, authorities said. No other people were hurt and none are believed to be missing, though firefighters are meticulously picking through the scaffolding and wreckage to ensure no one walking on the sidewalk got trapped in the hail of debris that rained down as the building collapsed. Workers said it sounded like an explosion. Some of the debris landed on a school bus on the street. No children were on the school bus and the driver, who was taking a nap in a middle seat, was not hurt. The Department of Buildings said the structure had been vacant for some time and the construction company taking it down had a full demolition permit. The city's preliminary investigation indicates the workers were only demolishing the interior of the building, using equipment like a Caterpillar. Authorities were looking into whether the building had any open violations. West 57th Street was closed in both directions to assist in the investigation and cleanup.